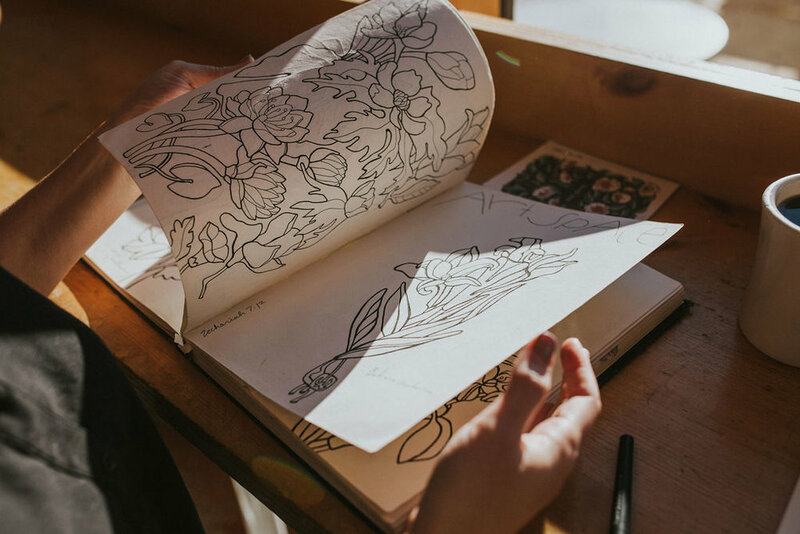 How to Keep a Sketchbook — Root & Branch Paper Co.
Keeping a sketchbook is one of the easiest ways to see a physical record of your creative process. I’ve been keeping a sketchbook since childhood, and honestly most of the time my sketches aren’t confined to one single book: they are in multiple books, on scraps of paper, the backs of receipts, crumpled church bulletins and whatever other papers end up being the canvas for my creativity. I hate sitting still and doing nothing, so sketching has long been my go-to survival method for long lectures, classes, seminars or sermons. Pretty sure that sitting through a long sermon and not being allowed to sketch is my personal definition of torture. So much of keeping a sketchbook is in the basic need to “get it out” … many of us feel a sort of release when drawing, even if the result isn’t something we’d want to share. Drawing can be relaxing, especially if you’re not focused too much on the end result. If you’re anything like me, focusing on the process instead of the end result is difficult. It takes a lot of practice. This is why sketchbooks are so important! Even though it’s mostly about the practice of just putting pen (or pencil or crayon or whatever!) to paper, keeping a sketchbook can also be as methodical and organized as you want it to be. In today’s blog post, I’m putting together a few tips to keep a sketchbook that not only helps you relax and stay loose creatively, but also becomes a compilation of your creative side that you’ll be proud to keep and share for years after it’s been filled. Choosing the right sketchbook for you is essential. Notice how I said the right one for you. Finding the right sketchbook isn’t so much about the perfect paper weight or binding. Though the physical details are important, it’s really more about your personal preference. Where will you be sketching? At home? In a coffee shop? During a lecture or sermon? Think about the places you’re most likely to take your sketchbook, and plan accordingly. Find a book that suits your lifestyle. I have one that fits right in my purse, which means I use it way more than I would use a bulky or heavier one. I prefer to work in small-scale drawings, so my favorite sketchbooks are small. I also prefer books with not too many pages, because I like to have a sketchbook that fills up quickly. Finishing a sketchbook makes me feel a sense of accomplishment! Take these details into account when buying your sketchbook. It doesn’t necessarily have to be the best book out there, but it does need to be something you love and will want to use all the time. For starters, see my "Scrapbooks + Sketchbooks" board on Pinterest. photo by Jessie Tyree Jenness for Root & Branch Paper Co. Choosing the paper of your sketchbook will 100% determine the end result of your sketches. The first thing to think about is the color of your sketchbook pages. It seems like a no-brainer, as most books come with some kind of white pages. But honestly, I LOVE working with a kraft sketchbook! I am most comfortable sketching with black ink only, and it’s rare that I add color to my sketches. I love the feel of kraft pages and it takes away the pressure I feel to add color! So think about your process… do you sketch in black ink? Do you like to watercolor or use another process that requires heavy papers? Do you sketch quickly in pencil and need a lot of pages to work with, or do you work slowly and meticulously? Does the idea of being able to add whatever you want sound interesting to you? Maybe set yourself up for success as a multimedia artist by getting a sketchbook with thick, durable pages in a heavy weight that can handle paints or other media without bleeding or warping. It takes a bit of time to get to know your own style or figure out a set of medium that you prefer. Even though a sketchbook isn’t going to be your final piece, it’s still good to have something that will hold up under the stress of your creative processes and withstand the test of time. You’ll want to look back at this later and celebrate your progress! Just as important as the paper in your sketchbook, but perhaps a little more likely to be overlooked, is the binding! Ponder your options: spiral bound vs. perfect bound, like a paperback novel. Do you want to be able to glue or tape sketches into your book as you go? Think about getting a book that has a loose enough binding to allow you space to do that. Alternatively, buy a book that has pockets to store your loose sketches. If you’re going to want to edit as you go along, spiral bound sketchbooks allow you to easily remove pages without damaging the book itself. If you want your sketchbook to feel like a big compilation when you’re finished, perhaps a hard-bound book will be your best bet (like mine in the photos above). If you’re most concerned about portability, maybe a small, simple staple bound book will be your best bet. It’s also important to note that if you’re going to want to do any scanning of your sketches later on (if you edit them digitally or use them to create digital artwork) then you’ll want to use a book that lays completely flat to allow for high quality scans to be made. One problem that I think holds a lot of artists back from getting the most out of their sketchbook is perfectionism, or fear of making something that looks really, really ugly. Especially when I’m expanding into a new style or subject matter that I don’t feel comfortable in, I really feel this fear nagging. Van Gogh says it best… every artist at some point had to push through the feeling that their work sucked. EVEN VAN GOGH. Because no one wakes up and is suddenly amazing at drawing, even the masters were beginners at some point. So by all means, get that sketchbook out and make crappy drawings. Over and over and over. This is how we learn! So my point here is, the best way to make a sketchbook is to be fully, completely okay with the fact that some of the pages in your book will be UGLY. It’s okay. Just accept it. If they’re so ugly that you can’t look at them, rip the page out, crumple and toss in the recycling bin. Here’s a little secret: everything in my sketchbook is not my first attempt. I regularly I do pre-sketches on copy paper because I know my first few attempts are going to be total crap. Once I have something I don’t hate, I move over to the sketchbook. Do what you need to do. Throw your practice sheets away if you hate them. Rip pages out of your sketchbook if you need to. Whatever you do, just keep drawing. The more you draw, the less you will hear the inner voice saying you can’t do it. I promise. Just keep drawing! This tip is more on the practical side but it’s so important! Over the years I’ve realized how essential it is to record every detail of the drawings I’m working on. Many times I’ll draw something from real life or from a reference photo, and when I’m going back through my sketches later, I won’t be able to remember what the sketch was based on. Taking the time to write down the little details of the subject matter is something I’ve drilled into my head through years of practice. The sketches above are from a few years ago, and at the time, I made sure to record the names and latin names of the flowers I drew. Looking back, I’m hugely thankful for that. The likelihood of me remembering those details now is slim to none. If I hadn’t recorded it at the time, I would have no way of knowing what type of flower that is if I wanted to do more drawings or expand it into a greeting card design or product in our shop. It’s also extremely important to make a note if you are copying or referencing another artist’s work in your sketchbook. There is nothing wrong with using another artist’s work as a point of reference for your own personal practice. Plenty of artists practice by copying famous works or trying to emulate the style of artists they admire. But this does become a problem if you claim your sketches as your own without giving credit where credit is due. You cannot sell or make money off of work that is a copy, that’s considered plagiarism and theft. Don’t do it! Copying another artist’s work is only okay when it is personal practice. This can go so far as using a photograph as a reference for a painting… if you use a very recognizable photograph, you will likely need permission from the photographer to share your take on their image. Be very sensitive in how you share “copied” work online, if at all, and only do so with reference to and permission from the original artist. We all know the old saying, “out of sight, out of mind” and this is unfortunately so true when it comes to building a sketchbook. If you put your sketchbook away on the tippy top of your bookshelf, what’s the likelihood you’ll remember to grab it on your way out? I’ve found that my sketchbook gets filled up the fastest when I leave it on a table next to the front door, so I see it when I’m heading out, and if I know I’m going to have some time to sketch, I can easily take it with me. I also like to keep a little set of pens, pencils, and erasers in my purse because you just never know when inspiration may strike! Do your best to stay prepared and you’ll find that sketching will become more of a mindless habit, and less of something you have to make yourself do from time to time. Your sketchbook will fill up in no time! One of the easiest ways to give yourself some accountability in your creative journey is to share your progress! Start a blog, post to Instagram or Facebook, and share what you’re making with the world. No matter where you are in your process, whether you literally just started drawing yesterday or whether you’ve been going at it for years, sharing your work is a way to boost your confidence as an artist. There’s also so much to be said for building a creative community: invite others to share their sketchbooks with you, and give each other helpful and encouraging feedback! If you’re interested in getting feedback, research a few sketchbook-related hashtags on Instagram and include them in your posts. This will get your work in front of other artists who will likely be more than willing to give you a little feedback or encouragement if you need it! 8. But what should I draw? Yes, I know. The scariest part of keeping a sketchbook is deciding what to put on that very first page. This Sketchbook Belongs To: in the inside cover, write your name and phone number and surround it with a drawing. Practically, this is always a good first step, in case you lose your sketchbook! Inside My Bag: Grab your purse, bag, or backpack and pull everything out. Draw the contents! My Favorite Things: Draw your favorite pair of shoes, sweater, sunglasses, hat, etc. Draw the things that a cartoonist would include if they were making a character based on you! Character Development : Draw the characters from your favorite book, movie, or TV show as you imagine them. Furry Friend: Draw your dog. Or cat. Or draw a picture of a llama that you found on Pinterest. World’s Greatest Toaster: Create a poster advertising an everyday object. Road to Somewhere : Sketch a map of a city that you’ve never been to but hope to visit someday. All About Me : Draw what you would imagine the cover of your biography to look like. Well, there we have it! Hope you’ve enjoyed these tips and tricks on how to keep a sketchbook! For more creative inspiration, tips and ideas, visit the rest of our blog or follow Root & Branch on instagram. I’d love to see photos of your sketches. Tag me!